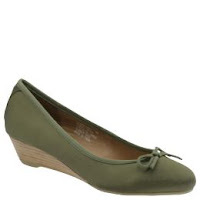 Speaking of olive, I found these adorable micro-wedge shoes at a Marshall’s in Atlanta last month. They’re part of the Kenneth Cole Tribeca line of casual (and cheaper) shoes. Super comfortable, versatile and only $23 from Piperlime today.